Our Alford shop is now closed for a few weeks. Work will soon start to refurbish, repaint and restock (enough R’s?) our Alford shop We are aiming to reopen (another R!) at the beginning of June and will advise you all of the exact date nearer the time. We are very pleased to announce that a new manager has been appointed and we will let her introduce herself to you in due course. Suffice to say she is a much valued member of the Fen Bank Team and will bring with her a wealth of experience and we know she is greatly looking forward to meeting customers, old and new. So if we could just remind you again, please do not take any donations to the Alford shop for the time being. 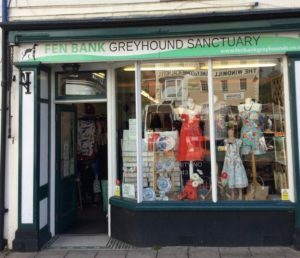 However our Spilsby shop, with Bev and her team, will be happy to accept any donations and also to show you what the shop has to offer. Copyright © 2019 Fen Bank Greyhound Sanctuary.